This morning I decided it was time to make a page all by myself, ie. without following a lesson from anywhere. I wanted to see how much I had learned and if I could, in fact, make a pleasing page. I think I did! But, maybe that's just me. This is our kitty, Burt. He arrived at our house in February and weighed in at approximately 2.25 lbs. He was a little mite of a thing, but nevertheless, it didn't stop him from climbing up onto my workspace table and checking out all the goodies I have strewn around there. He especially loves the ribbon holder. 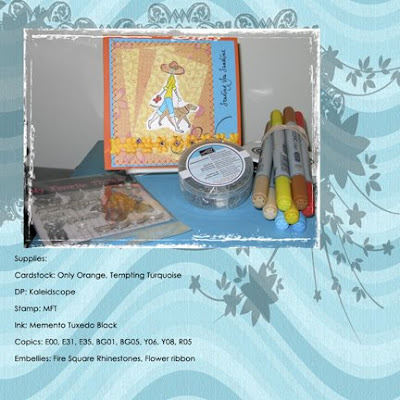 One of the most difficult things I find with digital scrapbooking is keeping supplies in an orderly fashion. I thought it would be easier than storing the hard stuff we use in cardmaking and the like, but this is every bit as challenging. For instance: how do you store your embellishment files. I have tons already from different stores and designers. Likewise with paper, photomasks, brushes, etc. How do you give credit for the items you use if you can't remember where you got them? So, I think the answer is to have one main folder called Digital Supplies and several sub-folders with the names of the designer/store. That could be broken down even further to have sub-sub files for paper, embellies, masks, brushes, etc. If anyone reading this has any ideas or a super method of storage of supplies, please, please share it with me. 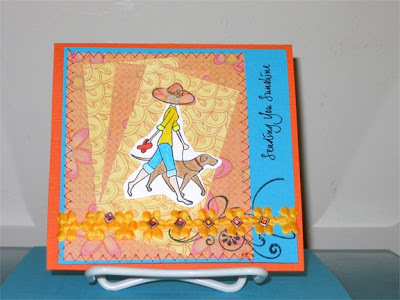 Combine digital knowledge with cardmaking! The card, way back there, is for a Sketch Challenge at The Stamp Shack. I wanted to use some of the things I learned while taking the course Now We're Rockin over at Jessica Sprague so that I wouldn't forget what I've learned. It will be a good way for me to pound Photoshop into my brain. I decided to put the supplies right on the "page" I made. Here's a close up of just the card. It allows you to see the smaller details, like the stitching and the rhinestones, etc. Lesson 4 is now completed! This has just been a fantastic trip. With all the notes provided, there is every reason for me to start mixing and matching and creating my own original layouts. A huge thank you to Jessica Sprague. Her teaching style and the videos are great. 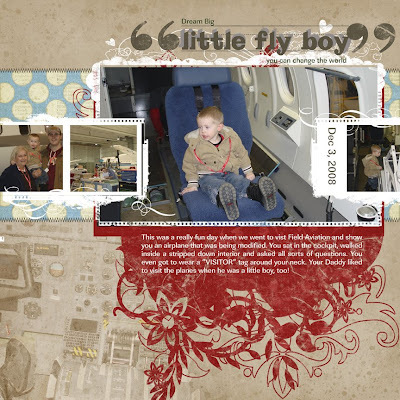 Little Fly Boy - Lesson 3 of Now We're Rockin! This class at Jessica Sprague is fantastic. I'm learning so much about digital scrapbooking and am absolutely enthralled and can add this to my long list of crafting addictions. Thank goodness for household chores or I'd be blind for working on the computer 24/7. I need to go get some groceries now which will allow me to use my long-distance vision muscles for a while. I really, really like the Color Throwdown challenges and here is my card for CTD #52. The colours in this challenge are Chocolate Chip, Certainly Celery and Perfect Plum. I'm actually going to use these colours for an ATC swap over at The Stamp Shack. I used the prototype of the ATC for the main image on this card. 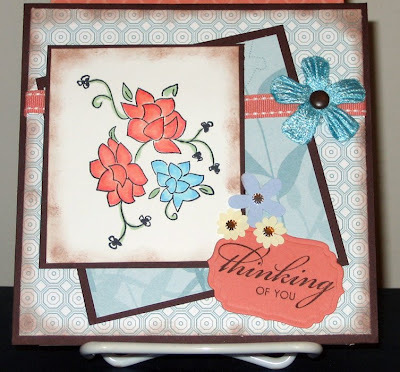 The stamp is by Gina K. Designs and is part of the first Carolyn King Collection. 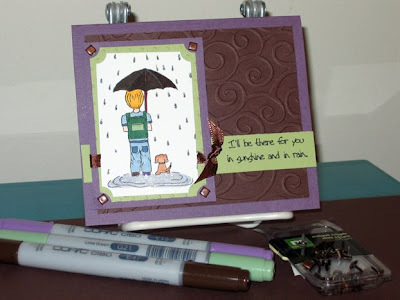 To my Shackie friends in the Rainy Day ATC swap being hosted by Robinkay, here's a little preview for you. If you've been following my blog the last few days, you'll know that I'm taking the course, Now We're Rockin', over at the Jessica Sprague website. It's such a cool course, I can't say enough about it. You should just go look! Lesson 2 was phenomenal and here's my digital layout. These photos were taken at my son's wedding last October (2008). 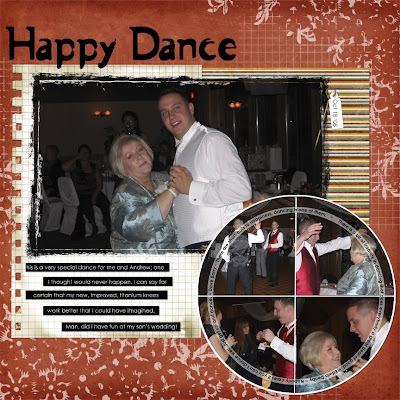 It is entitled "Happy Dance" because there was a time in my life that I could barely walk, let alone dance! After having both knees replaced back in February 2008, being able to dance at Andrew's wedding was like the "icing on the cake". Come back tomorrow 'cause I'll have a card for you. I'm going to make a card tomorrow so I don't forget how! LOL! Today's challenge at The LilyPad had me using some of my newly acquired skills from my classes at Jessica Sprague. The LilyPad challenge was all about summer weddings, Tiffany Blue (I really don't know what this is), and beachy-style weddings. 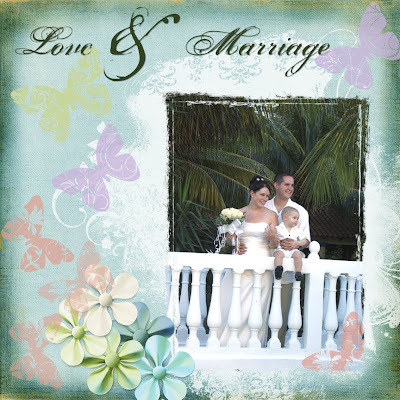 Well, I had just the photo as one of my son's got married in Cuba in December of 2007. Take a look. All the products needed to complete this digital layout are from The LilyPad, with the exception of the grunge mask I used on the actual photo itself to soften up the edges. The paper, the underlying white mask (it was originally black, I just changed the colour), the flowers and the butterflies are available at The LilyPad. 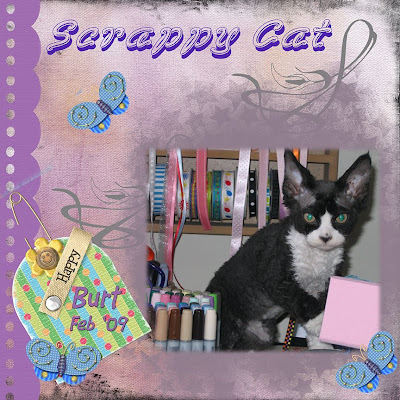 You should go take a look at the amazing array of product available for digital scrappers. Thanks to MandaKay and The LilyPad for this week's challenge. 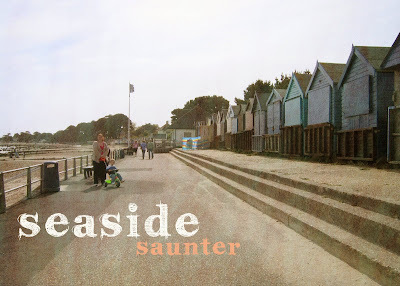 I may have to re-name by blog if this keeps up! Maybe it should just be "Barb's Creations" and leave it at that. I'm in deep into the digital scrapping now. 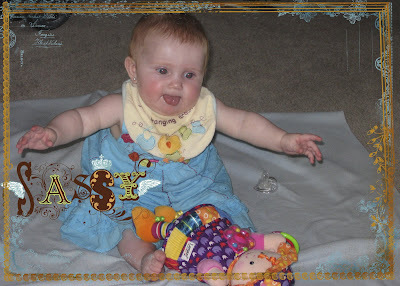 I have started another class, Now We're Rockin', on the Jessica Sprague site. Everything required to complete the page below has been provided and then some. I've been working on Lesson 1 off and on all day and finally finished just moments ago. 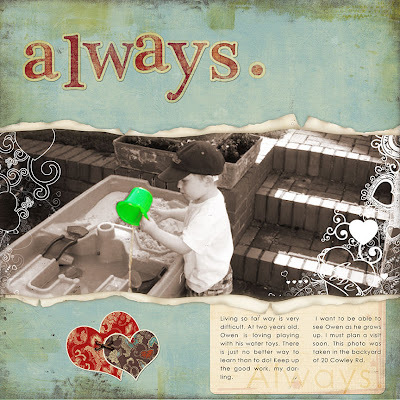 Okay, so presenting my first work in this particular class, is Owen playing in his yard. 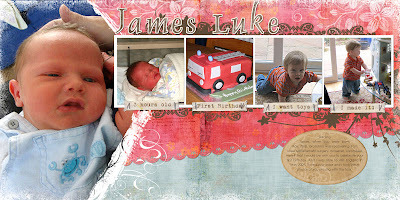 This photo is from last year when he was two years old, but I used it because it was the right shape for this layout. Even though this is only Lesson 1, I'm pretty sure I'm going to take another course when this one is over. 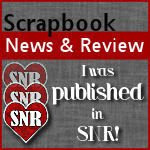 Digital Scrapbooking - my newest love! I have been busy this week taking the Photo Editing: Frame-Ups and Special Effects course being offered by Jessica Sprague. It's been a fantastic trip and I want to share with you some of the photos and/or pages that I have created. But, before I do that, I want to give huge kudos to Jessica Sprague for preparing such terrific and, more importantly, easy-to-follow, tutorials. Okay, on to projects completed using the techniques I've learned. 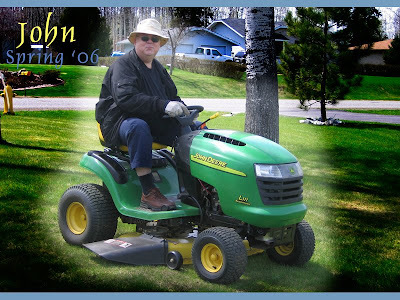 This is my DH, John aka GrampaStamper, on his beloved tractor. It was taken when we lived in Thunder Bay and had close to an acre that needed to be mowed. 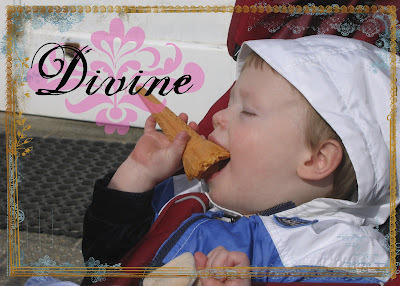 Next up is one of my very favourite pictures of grandson James enjoying his favourite pasttime: eating! I made this a 12 x 12 scrapbook page. In this lesson we took a colour photo, turned it into black & white then highlighted a specific image within the photo. 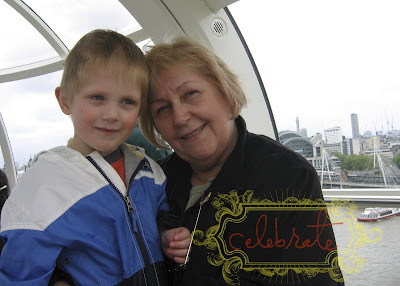 Another fave from my trip to England is this photo of DD Kirsten and grandson Owen. Here we are taking a walk along the beach in Christchurch in Dorset. 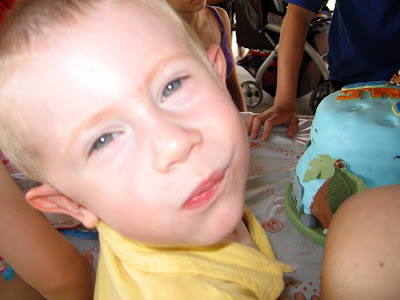 Owen loves being there and enjoys finding shells and such to take back to nursery school to use in crafting projects. And last, but not least, is a picture taken at North Lake in Prince Edward Island. North Lake is located on the north eastern shore, very close to East Point. This is also a 12 x 12 scrapbook page and I'll let the photo speak for itself. We had so much fun yesterday at Jackson's birthday party. It was held at Valens Conservation Park and it was a wonderful day weather-wise. The day started out poorly with dark clouds and rain, but by noon it was bright and sunny, just perfect for a picnic. There were lots of kiddies there and it was great fun watching them just running around and playing together. 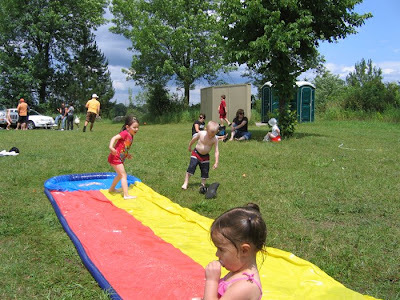 There were lots of water balloons for older kids and slippy water slides for the younger ones. There were babies in strollers and babes in arms. There was even a 2-month old from Switzerland! 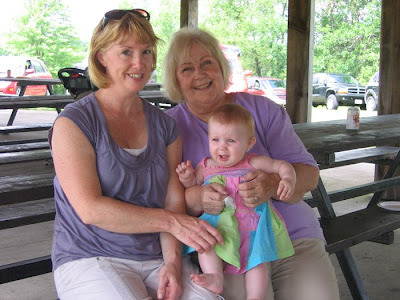 Aunts, uncles, cousins, and all parents and grandparents had a terrific time. Here's a few pictures to support the above claims. Okay … so it’s been a while since I’ve hi-jacked this blog but really, I didn’t have much time and less to bark about. First, this here is a link to YouTube for some background music. Right-click on it and open a new tab (or window) and come right back so you’ll hear the music but you’ll still be reading this entry. This year will be even more difficult than past ones as I’m really limited in mobility and she handles all the finances so there’s almost no way I can surprise her with anything. More home improvements are probably the gift that really says “I Love You”. All the door knobs have been replaced with those neat lever type ones and they look good. As it turns out, changing door knobs is best done sitting so it was a job I could perform myself and I’m quite proud of it. I hope you enjoyed the song. 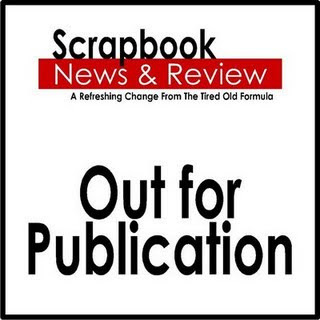 If you look to the right-hand side of the blog, you will notice a new picture about being published in Scrapbook News & Review. YES! YES! YES! I received an email last night saying that one of my cards will be used in the upcoming publication. Well, you could've knocked me over with a feather. I'm thrilled beyond belief. I believe the publication will be available on July 18th, if you want to check it out. It's an online magazine (I like because no paper to accumulate) and the subscription prices seem to be extremely reasonable for what you get in the magazine. Please, go check them out. I'm now taking a FREE course in photo editing currently being offered by Jessica Sprague. I've taken a couple of her classes and, let me tell you, they are terrific. Her instructions, via video, are clear and in language I understand. Believe me, not all online courses are so friendly. We're into Day 2 and here's three pictures I will share with you. Day 1 ~ Working with frames and word art. Day 2 ~ Working with brushes. That's it for today. Drop by tomorrow to see what I learn next from Jessica Sprague. Now that's what I call efficient, baby! I absolutely loved the challenges from Color Throwdown, which is challenge #49 and the Sketch Saturday challenge, #58. I had no choice but to combine the two. The colours I used for CTD #49 were Groovy Guava, Chocolate Chip and Soft Sky. Is this not an amazing colour combo. And the sketch, well, it's just perfect with this flower image. I had fun doing it and now I'm off to clean up my stamping area because DD is coming over with her friend and we're going to design some invites for her friend's birthday party invitation. See you soon.